Peel and cut the yucca into 3 to 4-inch rounds. Bring the rounds to a boil in plenty of water with salt to taste. Cook for about 20 to 30 minutes. Once soft but still firm, drain and remove the inner root. Cut into fingers. Heat the oil and fry the yucca until it turns light brown. Drain over paper towels. Serve with cilantro cream sauce, or pink sauce (equal parts of mayonnaise and ketchup), or, with slices of lemon. If you prefer, you can use frozen yucca. This recipe is ideal to replace the French fries that complement hamburgers or fried fish. It can also be enjoyed as chips with hummus or fry sauce. 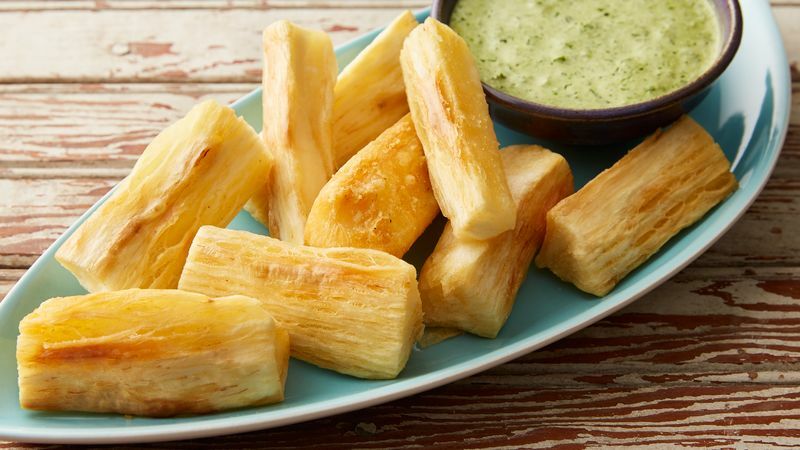 Yuquita frita is undoubtedly the perfect appetizer to complement a delicious meal. Yucca, as well as potato, is a Latin American tuber characterized by its high starch content. In Puerto Rico and in other Caribbean countries, it is used in several traditional dishes such as empanadas, alcapurrias, yuca al ajillo and pasteles de viandas.